Last week 70 former Maoist combatants joined the Nepal Army as officers, following 1,352 ex-combatants who became soldiers in the national army in July. The events officially conclude the demobilisation of Maoist combatants and the integration of some of them into the Nepal Army. However, there is unfinished business. We are headed to another election for a Constituent Assembly to try to write a constitution again. And the former enemies who are now ruling the country are reluctant to set up commissions to deal with the disappeared and for truth and reconciliation, as stipulated in the Comprehensive Peace Accord (CPA). 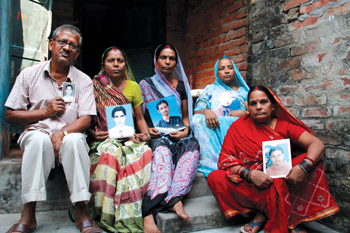 When it was signed in November 2006 the CPA required the political parties and the Maoists to inform relatives within 60 days about the disappeared or killed during the conflict. Seven years have passed and families of the disappeared still haven’t been told the truth. On 1 June 2007, the Supreme Court ordered the government to enact a law to criminalise enforced disappearances, establish a high level commission of inquiry on disappearance, and provide compensation and relief to the victims and their families. It was never implemented. On Friday, families will come together as they do every year on the International Day of the Disappeared to remind the state that the war is far from over for them. Sanjeev Kumar Karna from Janakpur was 24 when he went on a picnic with his friends on 8 October 2003. The next day, his father Jai Kishore Labh got a call saying his son had been detained by the police. Sanjeev was never seen again. 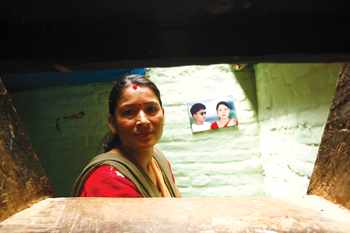 “Why are they still hiding the truth from us?” asks Bimala Devi Karna, Sanjeev’s 58-year-old mother. Together with Sanjeev, his four friends Durgesh Labh (23), Shailendra Yadav (17), Jitendra Jha (20), and Pramod Mandal (19) were also disappeared. Their parents Bauwey Ram Yadav, Jibchhi Mandal, Indira Jha, Bimala Devi Karna, Gayatri Devi Karna) posed for a group picture in Janakpur last week (pic, above). The current Inspector General of Police (IGP), Kuber Singh Rana, was posted as SP in Dhanusha where the disappearances took place. Jibchhi Mandal, father of Pramod, made it a point to question UCPN (Maoist) Chairman Pushpa Kamal Dahal during a recent Janakpur trip about why his government promoted IGP Rana. Shyam Bhatta was busy attending to customers at his grocery store in Old Naikap in October 2001 when a group of young men who identified themselves as revolutionary students took him out for interrogation. His wife Shova tried to hold him back, but he said there was no harm talking to people. Shova (below) never saw her husband again. “If only he wasn’t home that day, maybe my children would have grown up with a father,” says Shova. Twelve years on, her son and daughter are now college students. “I don’t really remember him,” says Subhash Bhatta, who was only five when his father was taken away. Shova is now a member of the National Network of Families of the Disappeared and Missing and says meeting other families like hers has given her the strength to fight for justice. “I have not lost hope yet and refuse to believe my husband is dead until we find his remains and perform his last rites,” explains Shova. Losing the sole bread-winner of the family has been hard on the Bhatta family and Shova blames not just the Maoists, but the other parties for not being willing to face up to the truth of conflict.